After a three-week break for the Confederations Cup, the Copa Libertadores got back up and running last night with Olimpia’s spirited 2-0 home win against Independiente Santa Fe. Credit must go to Olimpia coach Ever Almeida, as it was his tactical approach to the match that allowed the Paraguayans to remain on the front foot throughout. 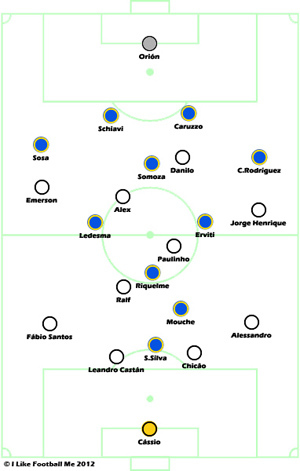 Almeida arranged his side in a 3-5-2 formation which annulled Santa Fe on several fronts. Firstly, Olimpia had an extra centre-back to protect against the Colombians’ rapid forward duo of Jefferson Cuero and Wilder Medina. The system also allowed them to play three men in central midfield to compete with Santa Fe’s own midfield trio, which is notoriously physical. Finally, against the narrow 4-3-1-2 shape favoured by Santa Fe, Olimpia’s wing-backs were allowed to operate with vast spaces in front of them, ideal for attacking the flanks and delivering crosses into the penalty area. Santa Fe paid the price for procrastination and in failing to make changes in the second half they allowed Olimpia to stay in control of the game and ultimately score their two goals. It was naïve of them to remain with three forwards, especially when 1-0 down. It may have cost them a place in the final. The other semi-final kicks off this evening, as Newell’s Old Boys host Atlético-MG in Rosario. Currently Newell’s are by far and away the best side in Argentina, but the gap in quality is so large between the domestic leagues of Argentina and Brazil, that it is Atlético who must be considered as favourites to reach the final. Both sides play a similar style of football: direct, high tempo and with plenty of pressure on the ball. The main difference between them is that Atlético favour long, sweeping balls to their quick forwards, while Newell’s prefer to play short, fast, vertical passing moves. Away from home and without either of their first-choice centre-backs (Leonardo Silva is injured and Réver suspended), I expect Atlético to adopt a more withdrawn approach than usual. With a more static defence, they can position themselves deeper in their own half and use Ronaldinho’s vision and technique to release Bernard and Diego Tardelli in the attacking third. Though most of the attention is being placed on the central players of each side, this match may well be won on the flanks. 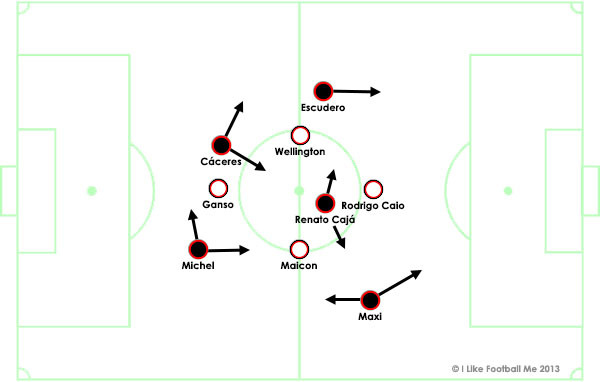 For Atlético, Marcos Rocha pushes so high from right-back that he often acts as an extra attacker. If the Brazilians are willing to open up in search of an away goal, they may be able to create something on that wing. Newell’s left-back Milton Casco is not the best marker, and their left-sided centre-back, former Argentina international Gabriel Heinze, has poor lateral movement and does not cover well. If Atlético can create some 2 vs. 1 situations on the right, they could cause their hosts real problems. While all this is going on, the first leg of the Recopa Sul-Americana will be played between São Paulo and Corinthians, at the Morumbi. The Recopa is South America’s answer to the Super Cup, but as the two major continental tournaments (the Copa Libertadores and Copa Sul-Americana) are played at different times of the year, I’ve never understood the relevance of this particular trophy. For what it’s worth, it will be interesting to see how Corinthians function without Paulinho, who has sealed his transfer to Tottenham. There were similar discussions after the departures of Jucilei and Elias, but Paulinho will be more difficult to replace. He has been the heartbeat of Tite’s Corinthians team for so long now, and they may require a significant amount of time to adjust to his absence. Since taking the Colombia job, Argentine coach José Pékerman has established a basic standard of selecting four defenders, two deep midfielders, and four attackers. Within these parameters, there are a number of variations Pékerman can make, depending on the match situation and the level of opposition.